The leadership and family members of the Indigenous People of Biafra (IPOB) worldwide view the fabricated and fake statement credited to one non existent local chief claiming to be a traditional ruler of an autonomous community in Mbaise Imo State as a failed attempt to poison the minds of Biafrans and deflect their attention away from seeking their freedom from Nigeria. The truth of the matter is that the alleged traditional ruler from Mbaise Eze Nwabueze Nnadi Ezewuiro (Agaba Idu 1) quoted in the publication does not exist. There is no traditional ruler or person of interest from Mbaise residing in Calabar going by the name Nwabueze Nnadi Ezewuiro. This is another agent provocateur publication in the mold of the equally fake ‘Okwudili’ the non-existent, phantom Biafra ‘leader’, designed to mislead the masses into thinking that certain Igbo traditional rulers are against the current IPOB led agitation Biafra independence. Nothing could be further from the truth, in fact it is a black lie. It is highly unethical for a national publication to facilitate the dissemination of what in essence a fake news, all in an effort to weaken IPOB or test the resolve of our global followership. The article which was carried by Nation newspaper under the headline “Igbo Monaco rejects Biafra says secession agitation a fraud” of April 14, 2018 was calculated and designed to impugn the integrity of the struggle for Biafra liberation championed by IPOB and led by Mazi Nnamdi Kanu. Biafrans are advised to ignore and discountenance this unfounded publications and similar ones in the future from those with vested interest in the continued existence of this giant colonial fraud called Nigeria. Findings by IPOB intelligence unit and family members in and around the five communities that make up Mbaise have conclusively determined that nobody with the name Eze Nwabueze Soronnadi Ezewuiro (Agaba Idu 1) ever existed, talk less of being crowned a traditional ruler. We know that DSS, APC government and those that have corruptly benefited from the misery of the Nigerian masses are behind this fabrication because they are terrified of the giant strides IPOB is making to restore Biafra and afraid of losing their ill gotten wealth deceptively accumulated over years at the expense of the well being of the masses. Those behind this fabrication must know that Biafrans are highly intelligent people and internationally proven to be the most intelligent race in the black world. Therefore, these kindergarten lies peddled by enemies of Biafra freedom will never hold water or gain any traction. It is quite unfortunate that DSS along with their APC regime and the support of Nnia Nwodo the embattled leader of Ohaneze Ndigbo, would unethically concoct such a fraudulent press statement with a fake name just to deceive the public. It is now very clear to all that IPOB remains the potent force it has always been despite the horrors of Operation Python Dance and the illegal abduction of our leader hence the concerted effort to degrade our movement through smear campaigns and outright lies. Our mission remains the same, total and absolute dissolution of Nigeria. We will not rest until the name Nigeria is eradicated from history books and completely abolished. Nigeria in its relatively short existence has brought nothing but untold misery, premature death to millions of people and bred a class of poorly educated ravenous individuals that knows the price of everything but the value of nothing. Nothing can stop IPOB, not even if heaven falls to earth. 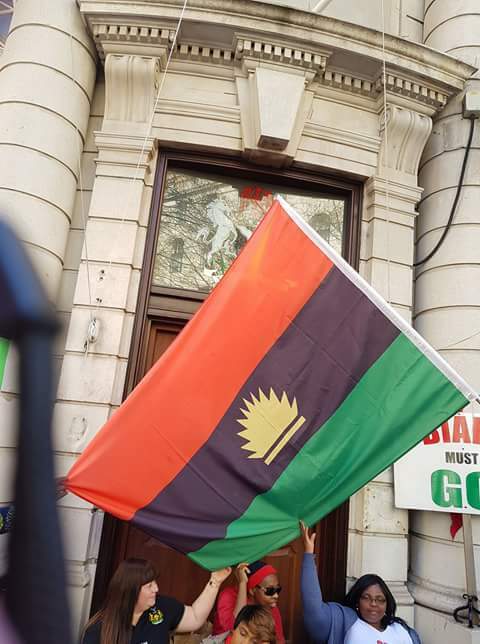 Biafra must be restored.